Every basketball loving kid in the world in the late 80's, early 90's used to wish they had a vertical jump like Michael Jordan. However, when Vince Carter entered the league in 1999 the basketball community became overwhelmed with "Vinsanity". He quickly took over the throne from "his airness". It was his performance in the 2000 N.B.A. Slam Dunk Contest that changed the world of dunking forever. Vince Carter’s showmanship and charisma—the celebrations of the dunks as much as the dunks themselves—amounted to an identity as much as a nickname: Air Canada. He also earned the fitting nickname “half man half amazing”. After the 2000 dunk contest people around the world wanted to learn how to jump higher or more specifically learn how to dunk like Vince Carter. 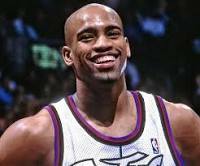 People have speculated that Vince Carter's vertical jump height was at one time over 50+ inches, yet the exact details of his jump height have been unclear. In this post we will determine Vince Carter's vertical jump height once and for all. We will also take a look at Vince's vertical jump training workout to see how he achieved such an impressive vertical leap. 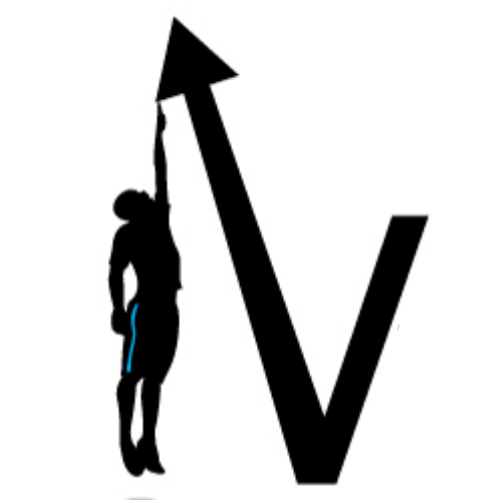 I will also give you some jump tips along the way, plus highlight some very effective vertical jump programs that can help you add inches to your vertical jump. Exactly How High Could Vince Carter Jump? How Does Vince Carter Jump So High? Since we know that Vince Carter stands 6 feet 6 inches tall we can calculate that if he could jump with his head level to the 10 ft rim he would have a vertical jump height of 42 inches. However there is some evidence to suggest that Vince Carter can jump high enough to get his head at least a 4 inches above the rim. The following videos are best evidence I could find of this. The quality of these videos are pretty poor but I am sure you will be amazed at what you'll see. Take a look and notice just how high Vince Carter can jump. From these videos you could easily assume that Vince gets his head a foot above the rim. This would mean that Vince Carter at one stage may have had a vertical jump of over 50 inches! Vertical Jump Testing has revealed than the average NBA player has a vertical jump height of 28 inches. Therefore, this puts Vince Carter well into the elite jumper category among his peers. It is important to note that the 28 inch NBA vertical jump average is measured from a two foot standing Sargent Jump. Most of the highest jumpers in the NBA have a 40+ inch standing vertical jump. Obviously a running jump such as the one Vince Carter performed in this video will generate a much higher vertical leap than a two foot static jump. From the footage you just saw it is is safe to assume the Vince Carter once had a running vertical jump of around 50 inches. Vince Carter's official vertical jump test results from the NBA combine was 43 inches. Very impressive for a young man. What is even more impressive is the fact that Vince Carter has maintained much of his vertical jumping ability over the past 20 years. Check out this photo of him registering a 40 inch vertical jump at 38 years of age! The photo above was taken at the P3 Athletic Center. 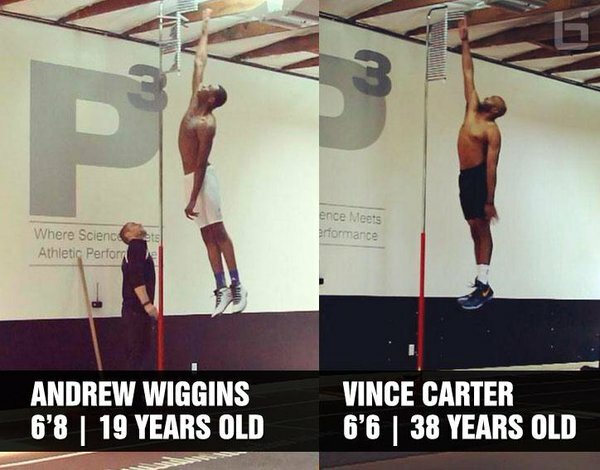 The team at P3 also recorded then 19 year old Andrew Wiggins vertical jump. As you can see in the photo below Vince Carter can still keep up with the best high flyers in the league. Vince Carter has had an unbelievable NBA career. It is just incredible that his body can continue to perform at such a high level after the years of wear and tear that comes with playing in the NBA. My personal favorite Vince Carter moment is the time he dunked on France’s massive 7 foot 2 inch tall center Frederic Weis. Not only did Vince dunk on him, he jumped over him. Frederic Weis is still haunted by this dunk. He refused to watch the footage for 10 years after it happened. I personally think that Vince Carter's dunk on Weis is the greatest dunk of all-time. Is there are better dunk you can think of? Let us know in the comments section if you do. It is no secret that Vince Carter has put in a lot of time and effort into his exercise, nutrition and recovery routine. In his 20th season Vince Carter is still jumping as high as ever. He has been reported to spend a ridiculous amount of time in the gym priming his body for success, when compared to his fellow teammates. This is a common trait that all the greats tend to have. Think Kobe, Lebron and Michael. They are all known for outworking their opponents. But exactly what does Vince Carter do to help him keep jumping so high? "My workouts aren’t as long as they used to be and I don’t use as much weight, but I still exercise four or five days per week...doing light movement and lifts, and keeping my core strong to prevent injury...As the summer goes on, I’ll take my body through a progression, adding more on-court work and more weight to my lifts. During the season, it’s all about holding onto the strength I built in my off months. Vince Carter also mentioned that he spends a lot of time stretching to optimize vertical jump and general athleticism. He states how vital stretching is in allowing him to keep playing at such a high level in his 40's. Here is a video of him describing his in season training. 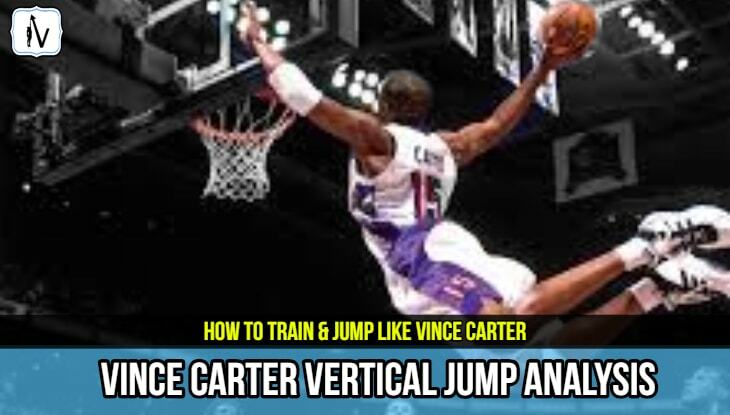 After listening to this and reading this post you probably get the picture that Vince Carter doesn't really do any specific vertical jump training. But "why not?' you may ask. Well for starters Vince Carter is genetic freak. He was dunking at the age of 14, well before he ever lifted a weight or did a plyometric exercise. Some very luck people are just natural jumpers. He is very fortunate in the fact that he only has to spend most of his time maintaining strength and mobility rather than gaining raw strength and explosiveness. It seems as though over the years most of Vince Carter's training has focused on core strength and control with the primary goal of injury prevention. This is a smart move as it provides longevity in the game of basketball. At the end of the day we can not compare ourselves to Vince Carter. If you were not blessed with great genetics you can still increase your vertical jump height and learn to dunk like the pro's. Unlike Vince Carter you will have to work harder on more specific vertical jump training exercises to improve your jump height. Genetic freaks like Vince, Lebron or Nate Robinson for example have the perfect blend of muscle fiber type, tendon length and neural activation for jumping. These guys also have very low body fat levels. If you are carrying excess weight you should consider losing this first before starting any vertical jump training. Losing excess weight can be one of the fastest ways to add a few inches to your vertical jump height (assuming relative power/strength remains). There are no secret exercises that can give you the bounce of Vince Carter overnight. To significantly boost your vertical jump any where near 40 inches you will have to put in months of serious work in the gym. Put in the time and effort and you will become a much more explosive athlete. If you want to take your jump to the next level like Vince Carter you should really consider following a proven vertical jump program. 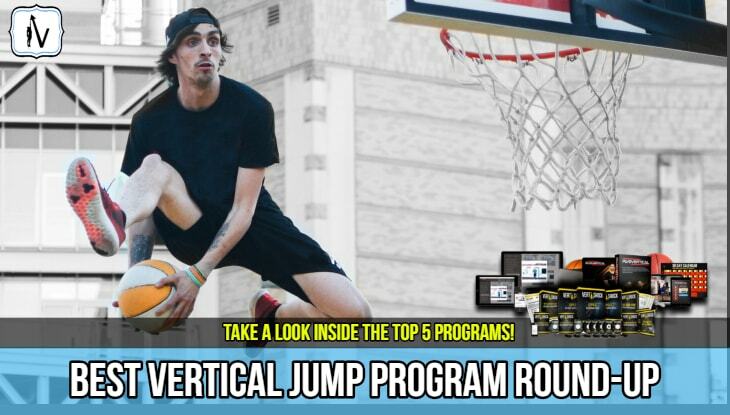 Be sure to check out our comparison of the 5 leading jump programs to make sure you find the perfect program for you. At 40+ years old Vince Carter still has a vertical jump height of over 40 inches, in his prime it may have been as high as 50 inches. The fact that Vince Carter could dunk when he was 14 makes it safe for us to assume that he blessed with great jumping genetics and did not require too much specific vertical jump training to get his hops. For the rest of you who want to get a 30+ inch vertical jump like Vince Carter you will have to get ready to work hard in the gym. Start plyometric training and lifting weights for a higher vertical jump.